How will Euro vrs.$Dollar, Gold & Dow end in June? Where will the Euro, the Dollar, the Dow and gold end up in June? Will Au(Gold) hit 1400, or the Euro find parity with the Dollar? Will the Dow dip below 900? Au(gold): Many in the gold trade believe that Au will hit US$1300/oz. On Friday June 4 Au closed below 1200 but by late afternoon it was clear how poor the financial markets had performed that Au rallied $20.00 in a short time. Perhaps the traditional competition of Au versus the US$dollar has changed because gold is becoming the safe investment and trade of our time. Debbie Carlson of Kitco.com reports that Mike Daly, gold specialist for PFGBest believes gold has decoupled from other markets: “It’s really become the beast. But gold doesn’t care what other markets are doing. It doesn’t even care what crude oil is doing. The world knows what gold is. It might not know what an S&P is, but they know gold and they want it.” As more investors look into the American economy and realize how weak the economy is because of poor manufacturing base, high unemployment and higher government debt both at federal and local levels, gold will be in more demand. BP’s Deepwater Horizon disaster will end in political controversy inability to reign in BP and more US federal bailout, more debt. Yes, there are good chances that Au(gold) will hit US$1400/oz. by June 30 2010. Euro/US$: “However, a word a caution, when market analysts and the wider media begin to forecast the collapse of any market or instrument this is the point at which it generally rallies” writes http://www.euro-vs-dollar.com/ on response that a long predicted decline of the Euro to levels below 1.20 can be quickly contradicted when the general media gets a whiff of the now stale scent. What is driving the Euro to levels of near parity with the US$? 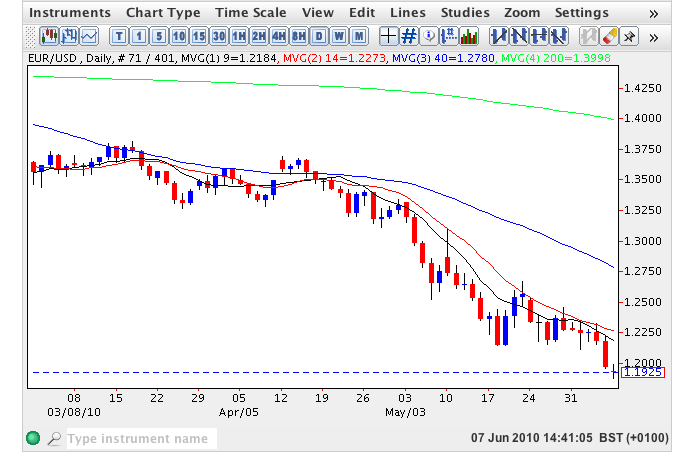 Looking at screen shot of a chart from Nov-07 to the present we can see the Moving Averages hug the 1.25 to 1.40 zone. 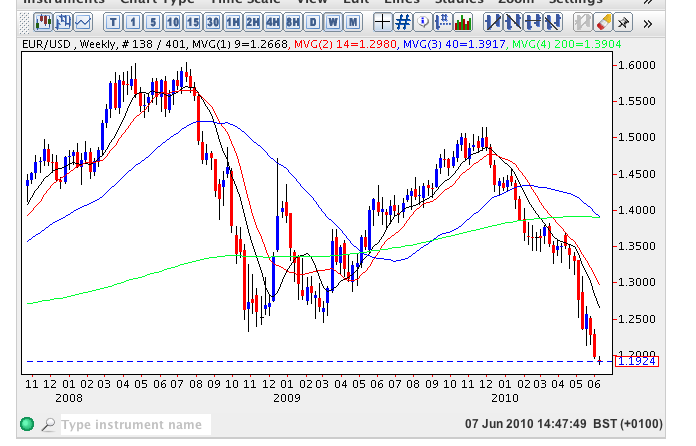 The Euro will hit below 1.10 by end of June but will still rebound as it has done before this time to a 1.36 level by end of the year 2010, as long as Germany remains in the Euro zone. France has threatened to leave while Germany wishes to expel Greece and highly indebted countries from the Euro zone but is this a probable situation considering the history of Europe’s banking system. Probably not for long, restructuring is more likely and a painful one. After centuries of quarreling and warring World War II left Europe under the protection of the USA, this artifice freed all these European estates to allocate funds into commerce and industry which before were used to keep up military campaigns. NO the Euro will not hit 1.00 by end of June more like 1.06 because the Dollar is weak and BP’s oil spill will be cleaned with taxpayers dollars this will keep from the Euro’s long slide into parity before July. The real question is will Germany introduce/go back to the Deutsche Mark? probably Yes, regardless of cost. Under a Euro Zone 1.3 because the expulsion of Greece does not solve the insolvency of 3 major countries: Spain, Italy and Ireland their collective expulsion is not practical nor wise, the Deutschmarks is. Will the Dow dip below 900 by June 30th? Summer is a slow season for trading but 9,000 is not far from 9,939 when considering that the Dow has dropped near 1,200 points since May. Yes it will dip below 900 by June 30th. PPP: Purchasing Power Parity is a 4 centuries old concept that tries to decide the absolute value of a unit of goods across international boundaries such as bushel of wheat. At the closing of Wend. 19-May-2010 The euro rose from to $1.2429, up 1.8% from $1.2204 in late North American trading Tuesday and recovering from 0.5% drop intraday, when it fell to a fresh four-year low of $1.2143. Down 14% from beginning of the year. The Euro moves towards parity according to Kit R. Roane a Fortune magazine contributor Based on IMF estimates of 2008 GDP and purchasing power parity among the various currencies, the euro zone is the second largest economy in the world. There are marked differences between PPP and market exchange rates. The Euro’s rapid decline could be caused by the €1 trillion bail out of Greece and shoring up of weaker EU economies such as Portugal, Italy and Spain. The ban prohibits market participants from naked short selling of euro-zone government bond markets and from purchasing credit default swaps, or CDSs, on government debt unless they own the underlying bonds. The ripples from a weak EU economy quickly affects markets in Asia and North America, slowing down the recovery from this recession. Why are we talking Euros? Because results of this week’s primaries did not capture Wall Street trader’s attention the Euro has. We pour money along Germany to saving Greece while England may not have to, considering that the UK has no stake in the euro the crisis affects the U$A strongly straight into our pocket books.